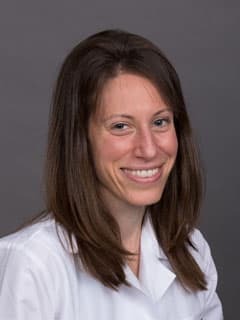 Alanna Strong, MD, PhD, is fellow in the Division of Human Genetics at Children's Hospital of Philadelphia. Strong A, Musunuru K. (2017) Genome editing in cardiovascular diseases. Nat Rev Cardiol. 14(1): 11-20. Strong A, Musunuru K. (2016) The (pro)renin receptor and LDL clearance: an old player joins a new game. Circ. Res.117: 187-9. Strong A, Patel K, Rader DJ. (2014) Sortilin and lipoprotein metabolism: making sense out of complexity. Curr. Opin. Lipidol. 25:350-7. Bearden D, Strong A, Ehnot J, DiGiovine M, Dlugos D, Goldberg EM. (2014) Targeted treatment of migrating partial seizures of infancy with quinidine. Ann. Neurol. 76:457-61. Ding Q, Strong A, Patel KM, Ng SL, Gosis BS, Regan SN, Cowan CA, Rader DJ, Musunuru K. (2014) Permanent alteration of PCSK9 with in vivo CRISPR-Cas9 genome editing. Circ. Res. 115:488-92. Strong A, Ding Q, Edmondson AC, Millar JS, Sachs KV, Li X, Kumaravel A, Wang MY, Ai D, Guo L, Alexander ET, Nguyen D, Lund-Katz S, Phillips MC, Morales CR, Tall AR, Kathiresan S, Fisher EA, Musunuru K, Rader DJ. (2012) Hepatic sortilin regulates both apolipoprotein B secretion and LDL catabolism. J. Clin. Invest. 122: 2807-16. Strong A, Rader DJ (2012) Sortilin as a regulator of lipoprotein metabolism. Curr. Atheroscler. Rep. 14: 211-8. Ai D, Baez JM, Jiang H, Conlon DM, Hernandez-Ono A, Frank-Kamenetsky M, Milstein S, Fitzgerald K, Murphy AJ, Woo CW, Strong A, Ginsberg HN, Tabas I, Rader DJ, Tall AR. (2012) Activation of ER stress and mTORC1 suppresses hepatic sortilin-1 levels in obese mice. J. Clin. Invest. 122:1667-87. Musunuru K*, Strong A , Frank-Kamenetsky M, Lee NE, Ahfeldt T, Sachs KV, Li X, Li H, Kuperwasser N, Ruda VM, Pirruccello JP, Muchmore B, Prokunina-Olsson L, Hall JL, Schadt EE, Morales CR, Lund-Katz S, Phillips MC, Wong J, Cantley W, Racie T, Ejebe KG, Orho-Melander M, Melander O, Koteliansky V, Fitzgerald K, Krauss RM, Cowan CA, Kathiresan S, Rader DJ. (2010) From noncoding variant to phenotype via SORT1 at the 1p13 cholesterol locus. Nature 466: 714-9. Strong A, Rader DJ. (2010) Clinical Implications of Lipid Genetics for Cardiovascular Disease. Current Cardiovascular Risk Rep. 4:461-8.